Lake Powell is the largest reservoir in Utah. It stretches from two miles south of the state line in Arizona upstream approximately 186 miles to Canyonlands National Park in Utah. 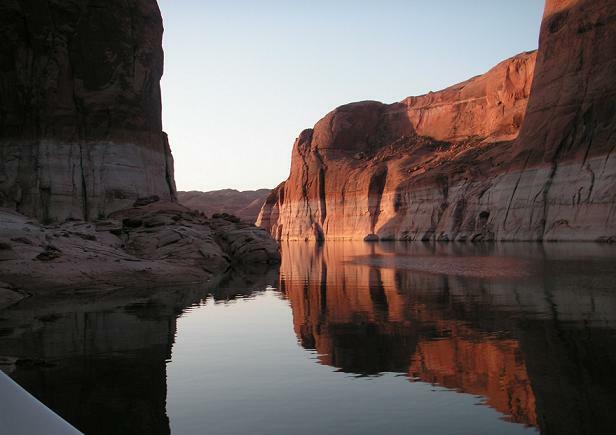 Lake Powell is one of the most popular reservoirs to fish in the West. Formed by the creation of Glen Canyon Dam, Lake Powell is located in northern Arizona and southern Utah. Lake Powell has something for everyone, whether you like to fish, waterski,	swim or snorkle, relax, ride jetskis or anything else. Lake Powell provides an excellent Striper fishery, as well as great action for Largemouth Bass, Smallmouth Bass, Black Crappie, Bluegill, and Channel Catfish, and you can even catch walleye, carp, and the occasional pike or trout. 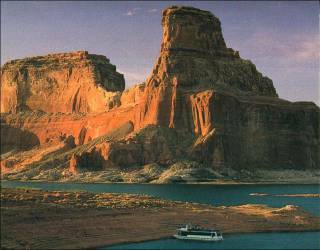 Lake Powell is a clear, deep canyon lake with little brushy structure. Most structure is rocks and cliff edges, with some sandy areas especially at the backs of canyons. When water level is rising, there is some brushy structure due to newly submerged shoreline vegetation. Catfish are ever present in the summer on shallow sandy beach areas and caught on stink baits, anchovies, and table scraps. Fish any place a boat can be beached for best success. Use a carolina or drop shot rig with a light weight or just a piece of bait with no weight in shallow water (5-15 feet). Watch out, sometimes if you fish a sardine on the bottom in a sandy cove, you'll reel in nothing but a tiny fish skeleton. No, it's not the work of the ghosts of dead shad, it's crawdads picking your bait clean! The biggest fish are in flowing water of tributaries. But the scrappy, great-tasting fish are commonly caught during the summer months. Striped bass are caught on many types of baits and lures, in many different ways. Cut dead anchovies work well when shad are not abundant. When shad are the main forage target then a shad-imitating lure works better. Surface lures, large marabou jigs, spoons and crankbaits work well around shad. Trolling with flat line monofilament is deadly as is leaded line and down-rigger trolling. The most exciting technique is to cast surface lures (stick baits) in surface feeding frenzies called striper boils". During the fall and winter stripers go deep but are readily visible with the use of a fish locating graph which reduces search time and greatly enhances total harvest. Remember to please keep all striped bass caught so the population can stay in balance with available forage. Striped bass are ocean fish that can live in freshwater. Now that this population is landlocked in Lake Powell they reproduce at an unprecedented rate. Stripers literally eat themselves out of house and home, and have eliminated shad from the pelagic zone on more than one occasion. From 1986-1990 there were almost no shad seen in open water of Powell. That period resulted in stunted stripers and led to the current management plan which is to reduce striped bass numbers by angler harvest. If enough stripers are removed then those that are left will benefit from the finite forage base and remain healthy and grow normally. That program has worked. In 2004 the average striper weighed about 3-4 pounds which is a good freshwater angling target. The fish are in excellent health. Stripers typically boil in the late summer to early fall. Largemouth are caught most readily in March and April and are closely associated with brush. 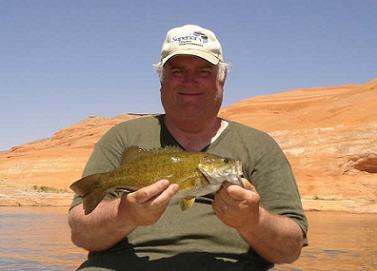 Smallmouth bass are found on rocky shore lines and may be the most common fish in Lake Powell. They can be caught in good numbers from April to October. Biggest fish are caught during the April spawning period. Standard bass gear should catch you either fish. Often you'll even catch smallmouth or largemouth bass in striper boils as they sometimes don't want to be left out of the shad feeding frenzy. Sunfish are underutilized and easily caught with live worms, dry flies and small plastic baits. Bluegill live in brush and green sunfish hide in rocks. Both are common on every shoreline and can be caught by anglers of all skill levels. Use the smallest hook possible (Aberdeen long shank preferred) to entice the schools of sunfish that often use your boat for shade at virtually any campsite. The larger fish are usually most aggressive and will be the first fish to take the bait. Once the larger fish are captured then many smaller fish will move into the vicinity and swarm around the bait. The larger specimens are big enough to fillet and provide some of the finest eating quality of all Lake Powell fishes. Even the smallest sunfish is big enough to bring a grin to the youngest anglers. Crappie are not abundant but they can be caught in bunches when a school is found in the spring, fall or winter. It is most common to catch crappie during April when they spawn. Nests will be seen in shallow water close to brush. The dark black crappie are males which guard the nest and insure the survival of the next year class. Please release all males. The lighter green crappie are usually females which are the ones that could be harvested. The crappie populaiton is not large due to the lack of brush in the springtime. Good numbers survive only in years when new desert brush is flooded by rising water during April and May. Catch and release is recommended. Live minnows CANNOT be used. Walleye are caught on bottom bouncing rigs tipped with live nightcrawlers during the month of May. They are most often caught by accident while fishing for bass, but some anglers fish specifically for walleye. Trolling close to cliff walls and across rocky points with a shad imitating minnow lure can be good at times. Consistent bottom contact while trolling or casting is the most important key in finding walleye. Walleye feed on rocky reefs and points near brush where forage fish and crayfish live. They prowl uninhibited at night and are still present in fairly open habitat at daylight and dusk. Once the sun hits the water walleye are forced to seek shelter in the form of shade. Walleye can avoid bright light by going deeper where light penetration is filtered by plankton, algae and other microscopic organisms. The focal depth of the water can be estimated by simply watching your lure descend below the boat. In some locations the lure will disappear at 8 feet while in others it can still be seen at 25 or 30 feet. The lure disappearance point is the minimum depth that walleye will be hunting at that particular location. Click here for current Lake Powell Fishing Reports. Small diameter fluorocarbon line is recommended (8-10 Pound test on spinning rod - 12-17 pound test on levelwind). If targeting brush or dirty water then the diameter and pound-test line size may increase. It is common to catch fish, particularly striped bass, at depths of 60 to 90 feet. Visit www.wayneswords.com for good information on Lake Powell fishing all year round.